After a wild 2018, Mark Orsley - Head of Macro Strategy for Prism (and formerly with RBC), is out with a review of his 2018 "Costanza Trades," while offering his comprehensive thoughts for next year. For those of you not familiar with George Costanza, his character on the sitcom Seinfeld could do no right when it came to employment, dating, or life in general. In one episode, George realizes over lunch at the diner with Jerry that if every instinct he has is wrong, then doing the opposite must be right. George resolves to start doing the complete opposite of what he would do normally. He orders the opposite of his normal lunch, and he introduces himself to a beautiful woman that he normally would never have the nerve to talk to. "My name is George,” he says, “I'm unemployed, and I live with my parents." To his surprise, she is impressed with his honesty and agrees to date him! I find employing the Costanza method to trading an interesting exercise. Ask yourself this: what are the trades that make complete sense and all your instincts say are right? Now consider the opposite. Basically what you end up constructing is an out of consensus portfolio. Bonus: Long active/short passive = going to put this as a tie. Passive won out most of the year, but is currently getting crushed/about to get absolutely rinsed. Also, in a classic bottom signal, active Hedge Funds/PM’s were shuttered around the street in Q4 at the absolute worse time. Active is now starting to have its day, and the passive tsunami is receding. Last year’s list was one of the most difficult to develop. Going into 2018, the market was divided between those who thought risk assets had gone too far and were due for a correction, and those who believed the economy is booming so let the good times roll. To be fair, both turned out to be true at different points throughout the year. Everyone loved them on the way up in 2018 and you had to own them to keep up with the market but now the FAANG’s, and tech broadly, are contaminated. Although street research is once again roundly predicting higher equity indices in 2019 (as they always do - insert rolling eyes emoji), market consensus among those that take actual risk has shifted extremely bearish. Funds have grossed down or liquidated, RSIs are oversold, and DSIs are near 0. However, the next shoe to drop is the retail investor exodus (it has partially started) that could lead to the mother of all passive unwinds. Imagine the horror on the face of the average investor as they open their Q4/year-end statement in a few weeks and sees the wealth destruction that has taken place in Q4. The natural investment psyche of the retail investor will be to sell and I think it’s hard for all of us to fathom just how widely owned FAANG’s are within index ETF’s. Therefore, I would have to imagine this trade will not work for Costanza right away, and there is severe risk that a deeper correction could continue into 2019. Google CEO Sundar Pichai, who boycotted a Congressional hearing this summer, is now playing ball with Congress saying he supports regulation legislation. The Federal Trade Commission still has an open investigation into whether Facebook’s conduct violated a previous settlement with the agency. Europe’s new far-reaching privacy laws and anti-trust investigations on tech companies. Uber being sued for anti-competitive practices. Those are just a few of many. The days of uninterrupted, carte blanche for Tech are a thing of the past, and thus a major regime change is happening. The only question is: is it all priced or not? The technicals indicate not. Instinct: margin compression from higher yields/wages, global government scrutiny, and retail investor unwind will lead to a much deeper correction. Costanza: funds have already purged these names, sentiment is at extreme lows, valuations more reasonable, and Tech is still the wave of the future. Estimated probability of Costanza being right: 25%. The days of tech rising unadulterated are over. I think we can say that conservatively. In my opinion, the government’s involvement in their business puts a top in tech for quite some time, at least in regards to tech names that have thrived on the collection of consumer data and/or don’t pay enough tax/postage. If the chart above is proven right, that 30% hole will be tough to climb out of by year-end 2019. I would rather buy THAT dip than this current dip. Costanza is a braver man than I. This also means broad US equity indices will struggle, albeit S&Ps not as much due to the “safe haven” names embedded within that index. However, since 2001 with similar extreme levels of being oversold, the market has been higher 100% of the time 1-year later, with an average return of 23%. So Costanza has hope given the magnitude of the selloff and poor sentiment; I just find it unlikely he will be happy in the first half of the year with his FAANG long. A similar call to the above long equities, since correlations run high with credit. 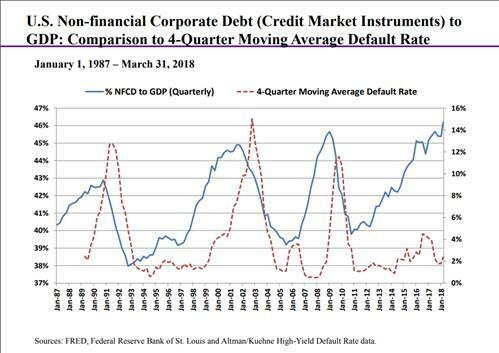 However, there are other issues with credit besides general risk sentiment, namely the massive amount of outstanding corporate debt, the large percentage of that debt that will need to be rolled, and the potential for credit downgrades should the economy enter a recession (which is what the front end rates market is pricing). This “maturity wall” which spikes next year and will likely need to be rolled comes at the inopportune time of the collapse in crude oil prices. 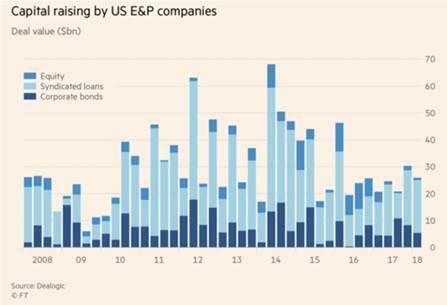 The energy sector is a big user of the US credit market. Thus the risk for 2019 is the US credit market seizes up in the face of the refi wave into a recession. A toxic combination and we can add in the fact that the European credit market will have less support going forward with the ECB stepping back next year. 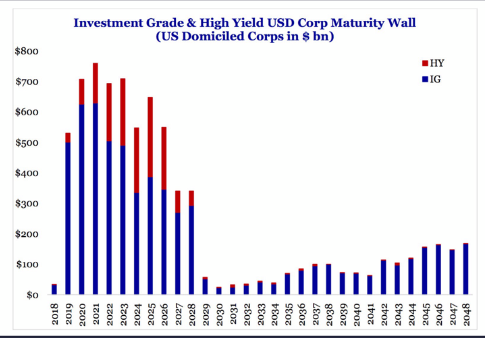 Instinct: the US economy is saturated with corporate debt and it is time to pay the piper with the coming refi wave. Everything gets exasperated if the US economy slips into a recession which will lead to higher default rates. Estimated probability of Costanza being right: 35%. I will assign this a little higher probability of working than tech longs. I am definitely concerned about the “maturity wall” and the trajectory of the US economy in 2019. For IG to widen out from here, you have to really believe the economy is falling off a cliff in such a way that defaults will finally rise, which then leads to even higher spreads and more defaults. It is not unrealistic, thus why I believe it is more likely that credit tightening won’t work. The one major point the credit market has going for it is the technical chart, which says that most of the move is played out. As opposed to tech charts, IG has reached its spread widener target. Thus Costanza could argue during his “airing of grievances” that all the bad news is priced. What a difference a year makes. Last year at this time, I was pounding the table on the coming resurgence of inflation and how the market was underpricing Fed hiking risk. 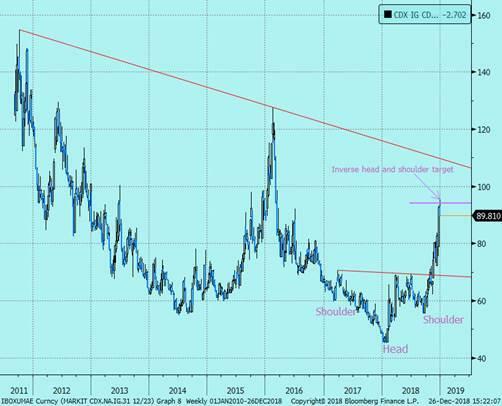 That successfully played out, but now post-stock market carnage, oil collapse, and peak economic data; Eurodollar spreads are pricing in a recession and rate cuts! Oh my. So this again continues the theme we have seen in the first two Costanza trades, revealing a market that is very worried about the trajectory of risk assets and the US economy as a whole. 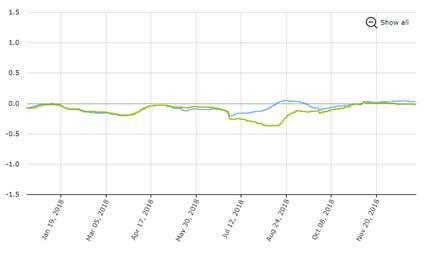 When you look at Fed Fund futures pricing for 2019 (using FFF9/FFF0 spread as my guide), you have 1bps of cuts priced into futures, versus an FOMC dot plot that is projecting 50bps of hikes (past ’19 you will discover even more rate cuts are priced in). So there is quite a gap that will need to be reconciled. 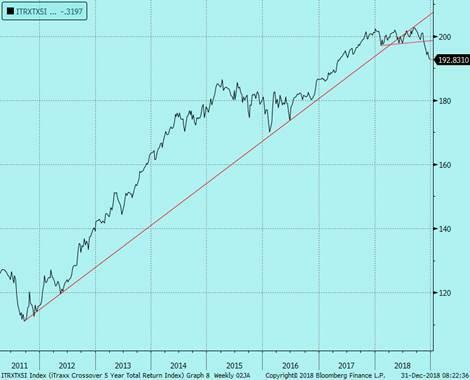 Will the equity market collapse help to slow an already fizzling economy or is there a possibility the economy recovers (China deal?) and the Fed continues on its course to normalize policy? Costanza’s “feat of strength” is taking the other side of the conventional wisdom that the housing, auto, and coming PMI slowdown due to the oil collapse either won’t alter Powell’s mission or will prove to be a head fake like in 2011. The slowdown in the data this year was likely caused by a front loading of activity pre-tariffs/trade wars (i.e. buy everything Q2 and then sit tight the rest of the year), so there is a chance that the higher economic trend reemerges, especially if the trade talks with China go well early next year (something Trump warned about this weekend). Costanza could be laughing at the thought he was able to buy ED spreads negative. Instinct: the US economy has peaked, the fiscal impulse dissipates early next year, QT increases, and regional surveys are already showing a coming slowdown. This will lead to a Fed pause now and possible cuts by end of 2019. Costanza: Powell is still indicating rate hikes and the economy is projected to grow 2.2% with CPI remaining around the 2% target. The kicker will come if Trump, feeling pressured by lower equity markets, makes a trade deal with China. The market will be caught wrong footed as the Fed continues to tighten as activity picks up again. Estimated probability of Costanza being right: 55%. Will give a slightly higher nod towards Costanza being right. Remember, he doesn’t need hikes to win, just no cuts which is a plausible scenario if Trump delivers a market friendly trade deal with China. Instinct: ECB, while still reinvesting, ended its APP, Draghi will want to get one hike off before his reign ends towards the end of 2019, the ECB desperately needs to get out of negative rates, Draghi will likely be replaced by someone more hawkish or at least less dovish, and fiscal stimulus to counter the populist movement will all lead to higher rates. Estimated probability of Costanza being right: 60%. If there was ever a Costanza trade it is this one. I am not sure there are many Bund bulls out there at 24bps so this is ripe for Costanza to be right. The chart is saying he will nail this one. 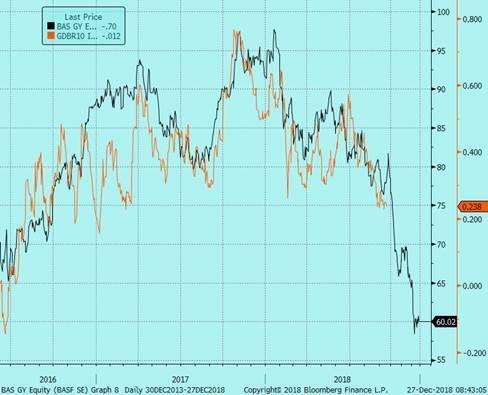 Idea #3 (long Eurodollar steepeners) and #4 (long Bunds) are basically implying that the US/German yield spread will widen once again in 2019 (assuming the ED steepeners are akin to higher US rates which has been the correlation). I would surely say that even combined, that idea is a Costanza trade. 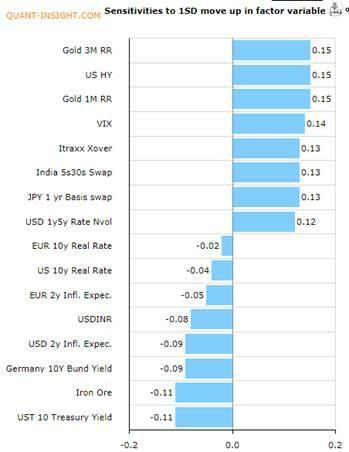 Most expect a narrowing of the US/German 10yr spread going forward. 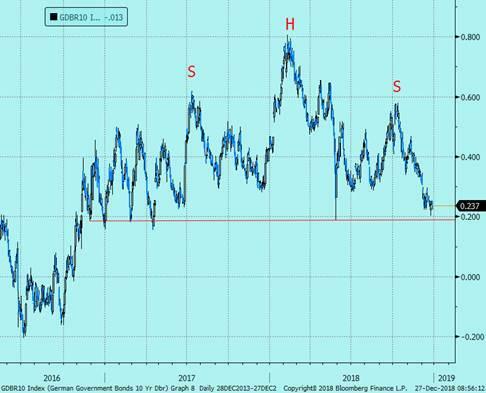 Since I hit on the Bund side of the US/German 10yr spread, what could drive US rates unexpectedly higher in 2019 and thus help to widen the US/GE spread? Now back to the list…. This has been an interesting correlation shift. For most of the year, Gold has been a pure Dollar play (especially vs CNH), but more recently Gold has picked up risk aversion, namely HY credit according to the Quant Insight macro PCA model. Instinct: risk assets continue to trade poorly and Gold offers portfolio protection for the apocalypse. Costanza: gold is losing its luster as a safe haven asset and, if the markets turn 2008-style ugly, it will get liquidated as well. Estimated probability of Costanza being right: 51%. No strong conviction here but Costanza is right more than wrong so a slight edge to risk assets stabilizing and Gold returning to its Dollar correlation. One of the most epic selloffs I have seen with a high-to-low collapse of 45% in just two months. The market narrative is now back to “elevated US production,” and more importantly, the Saudis, post-Khashoggi murder, have increased supply to push prices down for President Trump. Costanza would be quick to point out that spare capacity is low and the oil market suffers from chronic underinvestment. That underinvestment only gets amplified with oil prices sub-$50, and we are already seeing Permian producers cut back on capex plans. Additionally, the widening in credit markets only makes it harder to obtain capital for capex. So you have the double whammy of lower prices and wider credit spreads, which will feed into the underinvestment theme. The days of capital inflows are back to 2008 levels. By most analyst forecasts, even just a flat line of current production will cause a deficit in the supply/demand imbalance in 2019. We don’t need to be oil experts to know that when oil prices fall as precipitously as they did; rig counts fall and production declines. Now sprinkle in capex intentions being cut, along with credit issues, and that is Costanza’s recipe for higher oil prices. And, oh yeah, let’s not forget about the coming IMO 2020 regulations (sulfur emission reduction in cargo ships which will require heavy crude to be drawn from supplies to comply). Instinct: US is oversupplying the market with its light crude, and the Saudis are more than making up for Iran sanctions to appease President Trump in light of the Khashoggi killing. Costanza: low spare capacity will eventually catch up to the Saudis, and lower prices, lower capex, and a credit crunch will cause US production to flat line at a time when it needs to be increased (plus, the light API grade the US produces is not sought after). Estimated probability of Costanza being right: 70%. 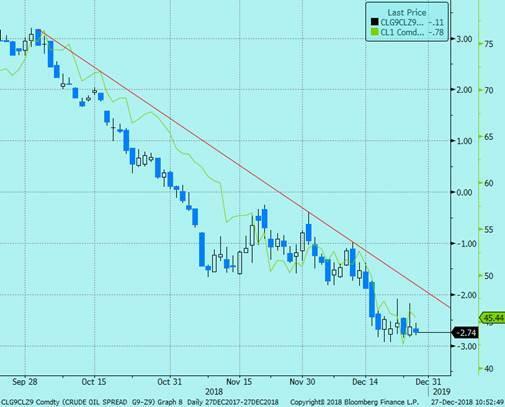 I think much of the oil decline was technical fund liquidations (most likely large Risk Parity types that were long WTI as their inflation hedge), and all the forward looking supply issues not only remain, but are amplified with lower prices and wider credit. Costanza is usually right and I think this one is a layup. Oil prices will be higher than $45 come this time next year. A slowing Chinese economy and therefore slowing commodity demand, trade wars, and a decelerating domestic housing market have all led to a steady decline in the Oz in 2018. Will keep this one short and sweet, as it is really the same idea as the other long risk asset trades. The AUD will really benefit from anything positive around the China/Trade War negotiations. Some sort of deal and the Aussie$ will scream higher. It’s that simple. 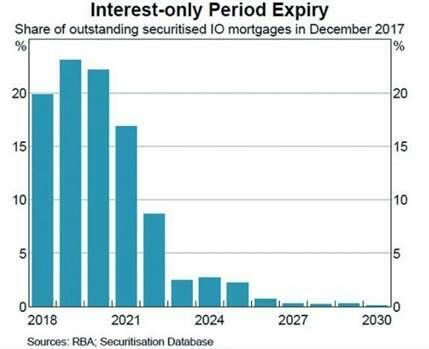 There is one micro issue Costanza should be concerned about and that is the Interest Only (IO) refi wave which will convert those IO mortgages into principle + interest loans. The reset wave started in 2018 and will increase in intensity in 2019. This will cause the average borrower to pay about $7,000 more per year in additional payments. That is a major hit to the housing market via delinquencies, and may be a crushing blow to consumers’ discretionary spending. The one saving grace for Australia has been the RBA remaining on hold for (jokingly) 37,000 consecutive meetings. 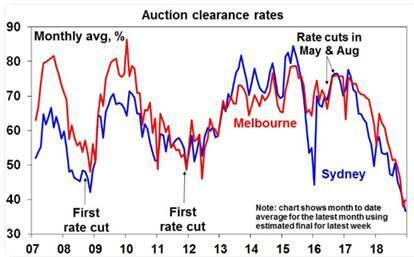 As the below chart shows, at this level of housing collapse, the RBA tends to cut. Instinct: Australia has felt the effects of the China slowdown and trade wars, along with its own domestic issues. The currency will need to continue to depreciate to offset that pain. Costanza: the equity market weakness will force Trump to play ball with the Chinese which will reverse the AUD higher. Additionally, the new economic weakness in the US and a Fed that could move to cut rates should weaken the USD. Estimated probability of Costanza being right: 55%. Basically a better long than FANGs and credit, as being long AUD$ could also benefit if the Fed moves to an outright easing bias (which will depreciate the USD vs. the AUD). Apparently, long USD is now the most crowded trade in the market (according to a BAML survey). A housing crisis in Australia will be the major headwind for the Costanza long. This would be Costanza’s hedge against all the long risk asset bets above. So why is being short EM anti-consensus at a time risk assets are getting rinsed and everyone has turned bearish? Through conversations with street analysts and clients, there is, for whatever reason, an insatiable demand to buy the EM dip. After all, EM has been selling off since January so it should be the first to bounce, right? That thought is “making George angry” and why he is going to take the other side of that. In a world where the China Manufacturing PMI just went into a contraction, European data is falling off a cliff, and US regional surveys are all pointing to a coming slowdown; is EM growth going to be booming and the place to allocate risk? I understand that it is a short dollar play, but 2019 could be marked by a major global growth slowdown and balance sheet recessions. That is not the ideal environment for EM. 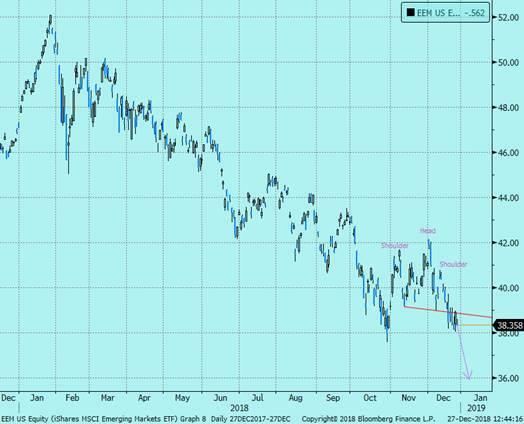 Instinct: EM has already taken its pain, Trump/China deal likely in 2019. Costanza: global growth slowdown will hurt EM the most, especially if USD funding issues reemerge. EM has never been a safe haven during growth scares and recessions. Estimated probability of Costanza being right: 55%. All signs point to a poor global growth trajectory in 2019. The selloff in bitcoin in 2018 was an once-in-a-lifetime move. From the highs just after New Year’s, Bitcoin spiraled 85% lower to take over as the largest historic bust since the Tulip crisis. The crypto naysayers had a field day this year. Costanza would hypothesize that if you believe the US Dollar is losing its hegemony, the US government debt issue is ballooning to unsustainable levels, Europe is in the midst of a populist meltdown, and China is on the verge of a hard landing; why aren’t crypto currencies like Bitcoin as viable a store of value as a yellow rock? 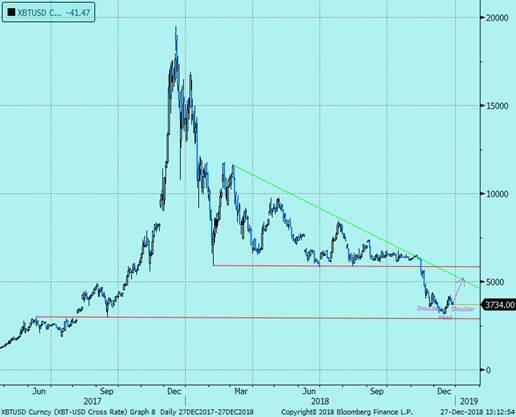 Interestingly, Bitcoin has started to potentially bottom during the December equity meltdown, lending some credence to the theory that investors are becoming concerned with the global environment and searching for new stores of wealth. 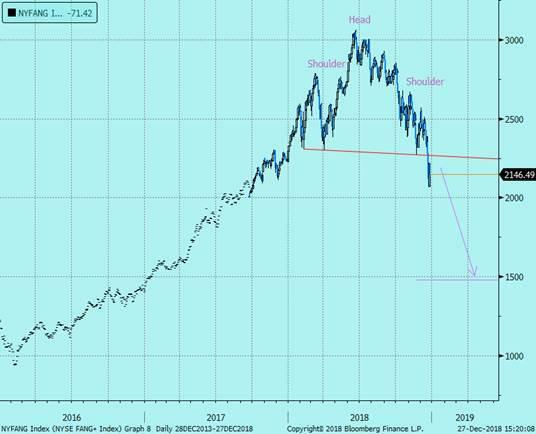 That potential bottom has formed a bullish inverse head and shoulder pattern that sets up for a retest of the 1-year downtrend…. Instinct: crypto currencies have no use and are on their way to near worthlessness. Costanza: Bitcoin is starting to rediscover its use as an alternative to traditional stores of value. Estimated probability of Costanza being right: 50%. No clue and no edge here. However, it is hitting support levels, it has a bullish formation, and there is extreme bearish sentiment which all reek of a Costanza trade. I cautiously put this in here hoping to avoid all political conversations and opinions, but I think this is an interesting nonmarket, yet market relevant idea. I don’t think many expect much from POTUS next year, given the House swung to the Democrats and many folks (mostly on the liberal side, to be fair) believe there is looming tail risk that Mueller has enough evidence of some sort of wrongdoing that Trump’s presidency could be in jeopardy. One could argue whether less Trump or no Trump is good or bad for risk assets. On the one hand, the more stable Pence could be welcomed by markets, and perhaps if Trump goes, trade war issues dissipate. On the other, the market rallied on his election victory in 2016, his policies are mostly reflationary, and China has become a legitimate nonpartisan issue. Therefore, even if Trump is ousted, trade wars likely continue unabated. The surprise, non-consensus idea would be that Trump crosses the aisle to enact Infrastructure. Couple that with an earlier than expected China deal, and that is how Costanza will be paid out on a lot of his risk-on calls. Perhaps the market is underestimating Trump, and he ends up delivering a great deal vs. expectations of a lame duck presidency. There is a lot of be worried about in 2019, and I believe we are only in the beginning stages of a risk asset purge. Costanza is much less worried. I want to wish everyone a Happy New Year! I look forward to speaking with everyone again soon and telling you more about Prism’s exciting business model.